I feel like it has been forever since I have posted something on here. We have had a really busy couple of weeks. 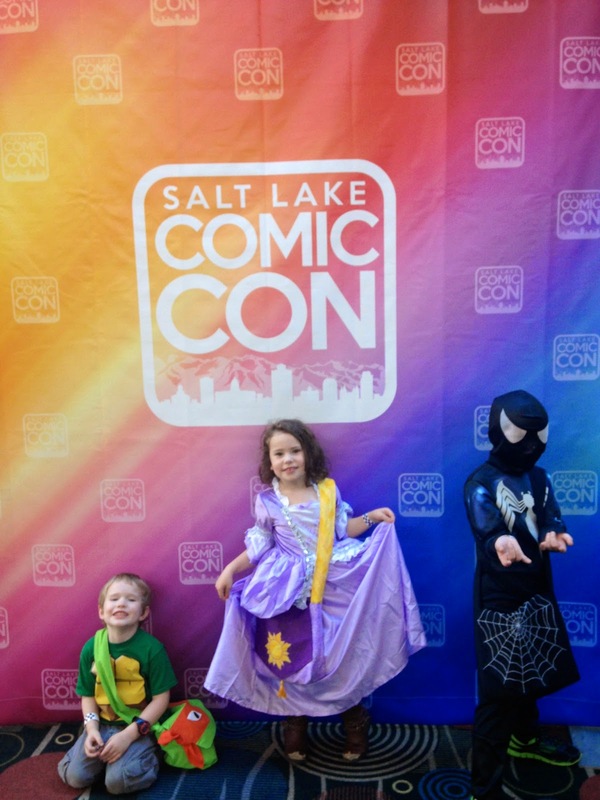 One of the things we had going on was Salt Lake Comic Con last week. 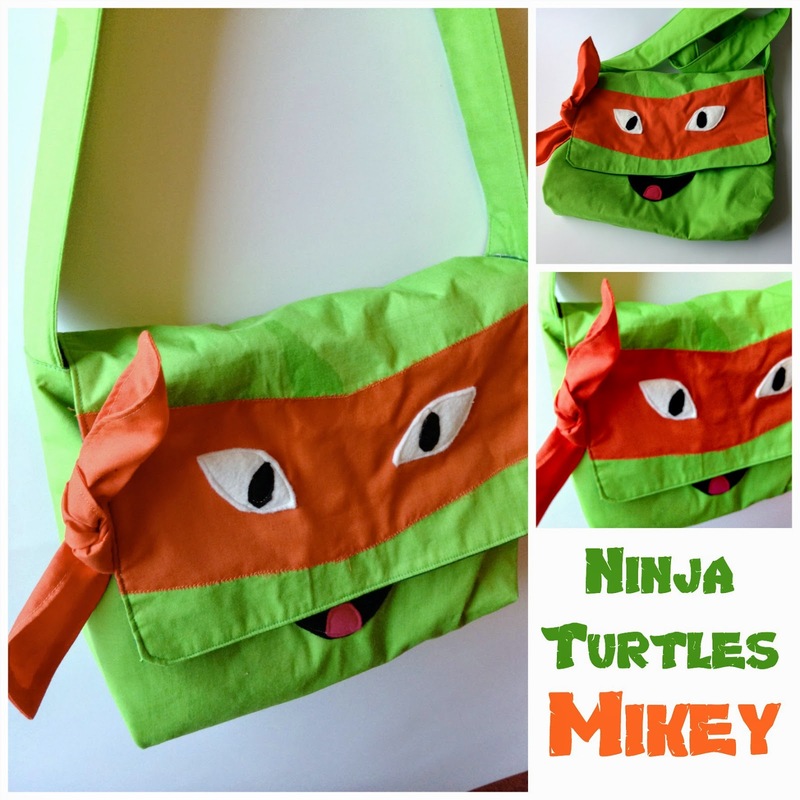 Probably about a month ago, the first time I did a geek-craft guest post on my husband's blog, he mentioned that he thought it would be cool if I made some bags for the kids to bring to Comic Con that we could then make a tutorial for and post on his blog as another geek-craft. I thought it sounded like a good idea. Right away I sat down and started sketching some ideas. I came up with several but the kids already had their costumes picked out so I chose designs that would match their costumes. We had a Black Spiderman, Rapunzel and Michelangelo. I had the designs ready but I got busy and kept putting off making them. I can be a huge procrastinator sometimes and this was definitely one of those times. I finally got started on them the week of Comic Con and worked on them here and there until Friday morning, the day we were taking the kids with us. Luckily, the bags themselves go together really easy, the embellishments take a little time but once that part was done they were a really quick sew. The longest part was definitely embroidering the spiderweb. In the end I was so glad to have them. It was so nice that the 3 oldest kids all had their own bag to carry their things in. 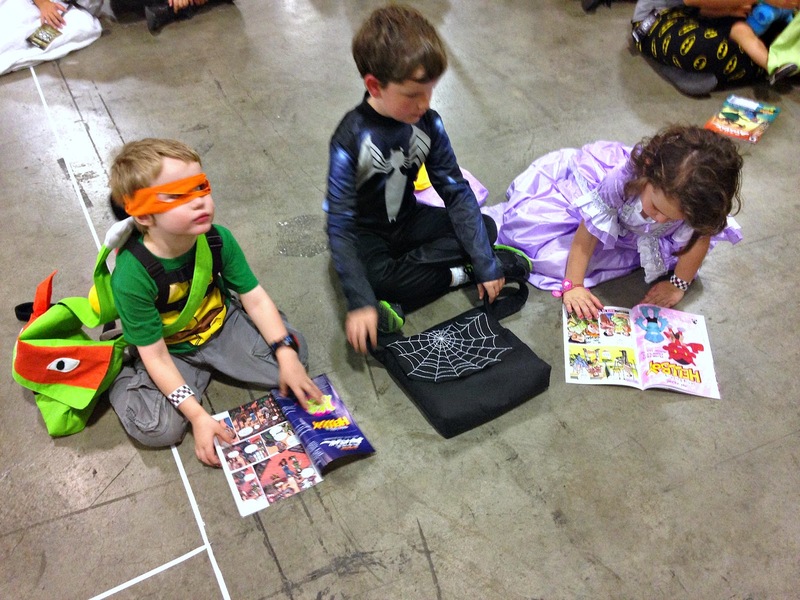 They each brought a water bottle that they carried and at one point they were each given a free comic book and they picked up all sorts of little stickers and papers at the different booths they went to. They could put all of their treasures in their bags and I didn't have to keep track of what belonged to who and carry it all around. You can find the tutorial here, at The Geeky Mormon. 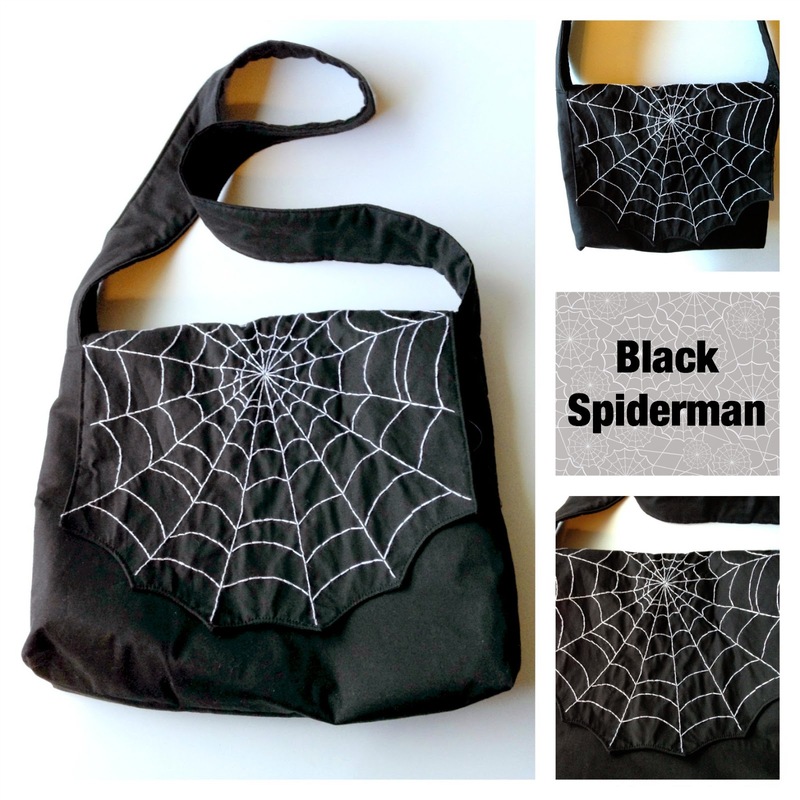 I explain how I made each of mine but you can use the idea to make any kind of bag imaginable. I sketched out ideas for Frozen bags, other superheroes, princesses and more. 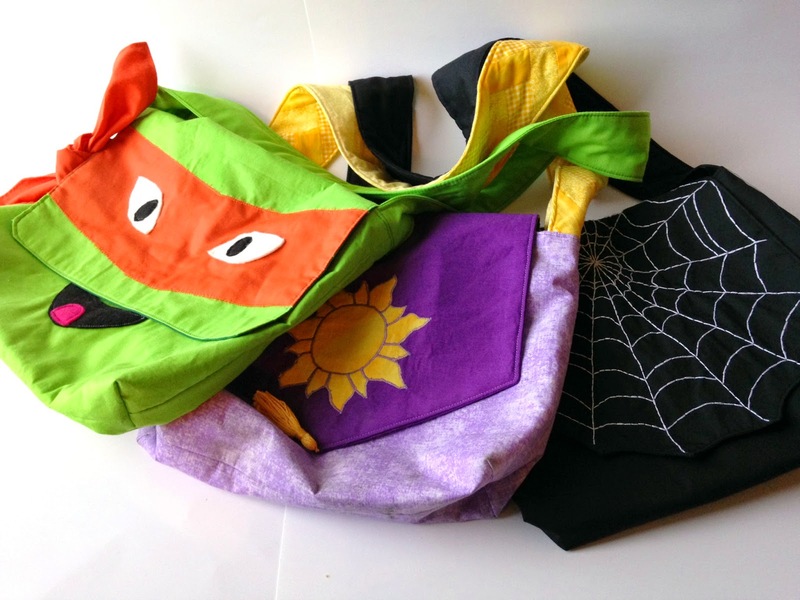 It was really fun to come up with ideas for different bags, there are so many possibilities to make something fun for your kids. Now for some closer shots of the bags. I did take these pictures after the bags had been used for a couple of days so they are a little wrinkly and dirty. Also, one thing I wish I would have done differently was to use a heavier weight interfacing so they would have stayed a little stiffer. I was only able to find lightweight at the store I went to so they are a little floppier than I hoped. Oh well, the kids didn't seem to mind. I made it with a limey green solid with a darker green lining, orange fabric mask and felt features appliquéd on. This was probably the easiest bag to make. 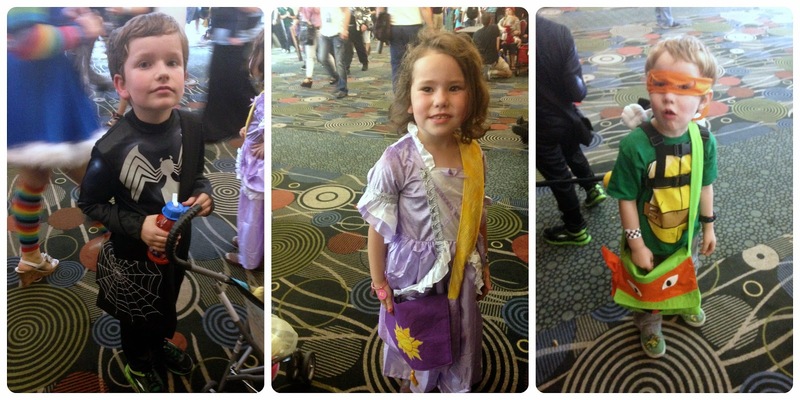 This one has a light purple bottom (to represent her dress), a dark purple pointed flap with a yellow sun appliqué (to represent the flags they fly) and a yellow tassel. I just thought the tassel made it look a little more royal but I'm sure it would look fine without that too. The strap is pieced to look like a yellow braid (obviously representing Rapunzel's hair). I really liked the way this bag turned out. It was probably my favorite one. I loved that the braided strap turned out the way I had hoped. It is always fun when things turn out the way you picture them in your head. This one took the longest by far. 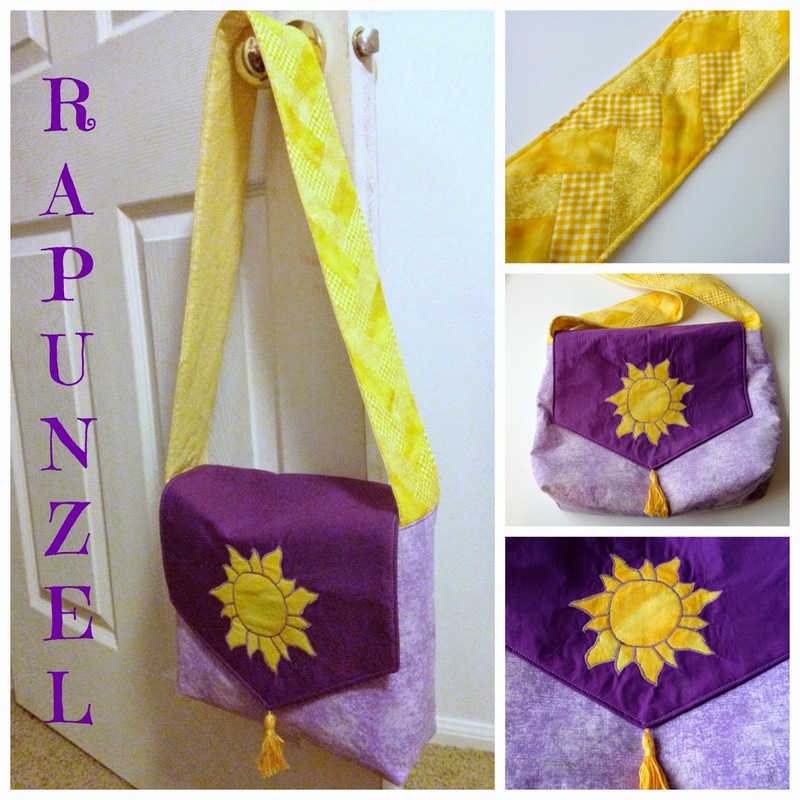 The Rapunzel bag was probably more complicated but the embroidery on this one took forever. In the end though, I was glad that I did it the way that I did because I was happy with how it turned out. Again, I was really happy that it turned out the way I had pictured it in my head. I was a little nervous that the inverted scallops on the flap would turn out right but I was very pleased with how the flap turned out. The whole project turned out to be really fun to make. These are my favorite kind of projects. I love being able to make something creative and unique for my kids, something that I couldn't just buy them in a store. This is the kind of thing that makes me love sewing. Especially when my kids are really excited about the finished product. Once again, you can find the tutorial for these three bags here at thegeekymormon.com. I hope you enjoy making your own bags. Que bolsos más bonitos y originales… Son geniales para los más pequeños de la casa!!! Te paso este enlace por si te interesa. Muchas gracias por participar en "DIY & KIDS"
de nada, gracias por invitarme.